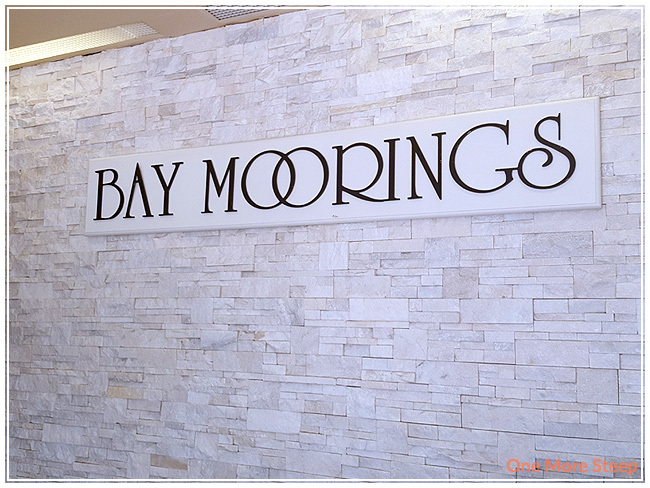 Bay Moorings Restaurant is located in Horseshoe Bay, West Vancouver. 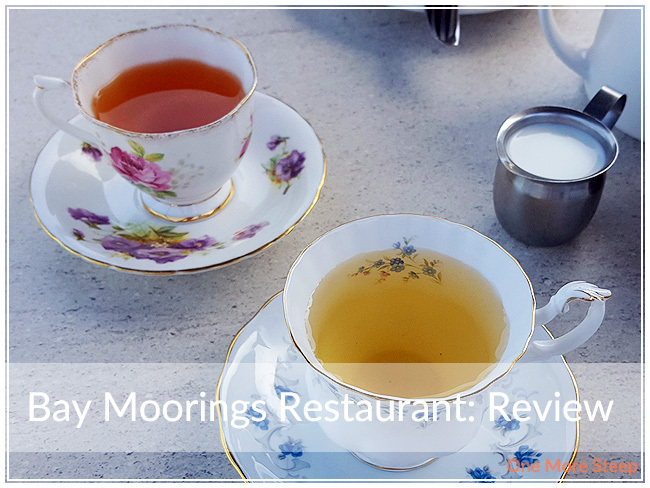 For those who’ve ever gotten onto the ferry at that location, Bay Moorings Restaurant is literally across the street from the ferry terminal – so if you’re a foot passenger, it’s a stop you could make before getting on with your adventures. 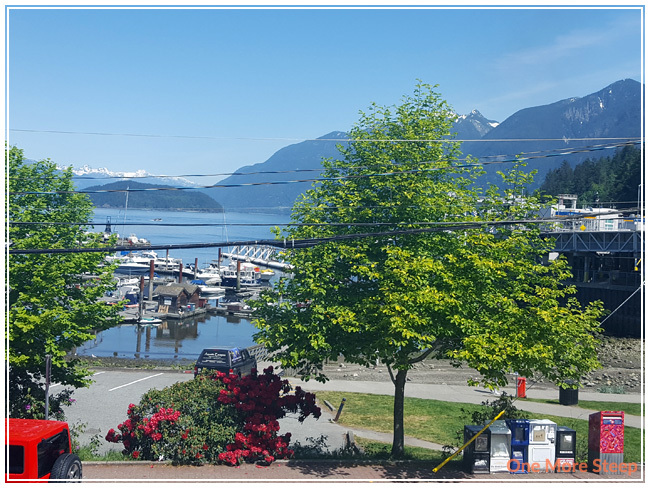 The views from their patio are amazing – you get the water with the marina, and then you can see the picturesque BC mountains. Honestly, the view is gorgeous. 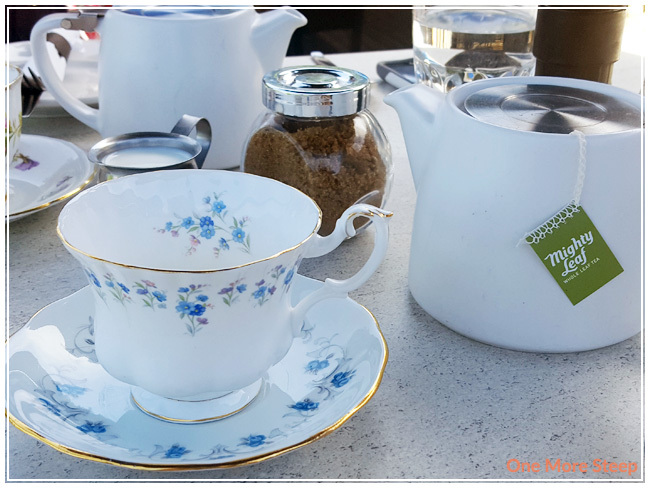 The High Tea at Bay Moorings features tea from Mighty Leaf. I picked the Organic Spring Jasmine (green tea) while my sister opted for the Organic African Nectar (rooibos). We received our teas in cute personal-sized teapots, the teas themselves were in tea bag form. Organic Spring Jasmine has a lovely jasmine aroma to it. This green tea steeped to a pleasant golden orange colour and had a great floral flavour to it. I did have my teapot refilled once, and the flavour was still quite strong, which made the tea enjoyable. The food came in two tiers with the desserts on top and savouries on the bottom. For the savouries, there were four items each. There was a ham & cheese sandwich, a smoked salmon wrap, a pate and caviar open-face sandwich, and a ginger duck confit. I found the ham & cheese cheese sandwich and pate & caviar sandwich to be a little bit lackluster with nothing to exciting about each of them. The smoked salmon wrap itself wasn’t very picture-worthy, but the flavour was delicious. It had a lot of sauce and dill inside of the wrap though, and I think it might have been better with a bit less sauce inside of the wrap. The winner was the duck confit, followed by the smoked salmon wrap. 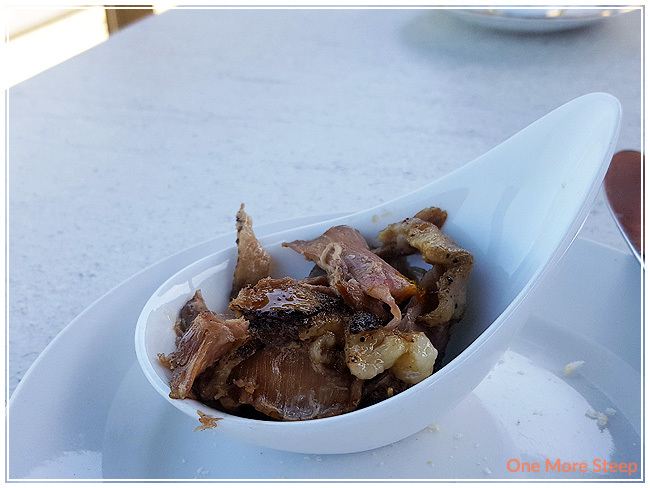 The duck confit had a lovely ginger flavour, the fat was rendered beautifully, and the meat was moist and well-cooked. The desserts featured French macaron, tiramisu, panna cotta, and a slice of coconut cream cake. We each received a different flavour macaron – I ate the green pistachio one while my sister had the lemon. The macaron was nicely made with the crisp outer cookie shell. I’m not a fan of coffee, but the tiramisu had a great custard layer and the cake layer did taste a lot like coffee (unfortunately for me). 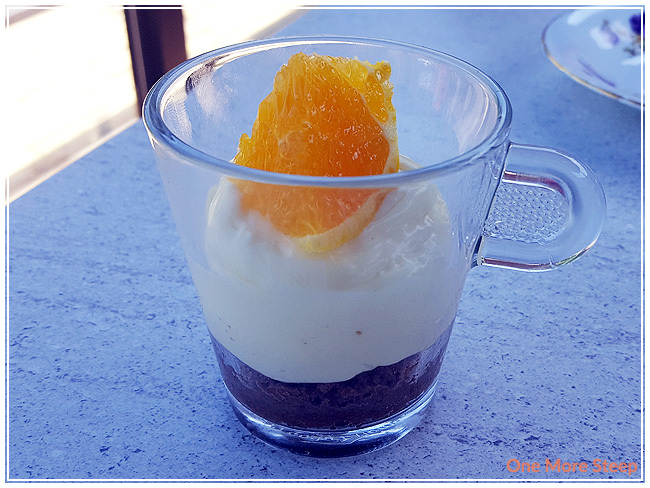 The panna cotta was delicious – I’ve made panna cotta before so I know it can be a bit of pain to keep the smooth texture, this one was delicious and I would definitely have it again. 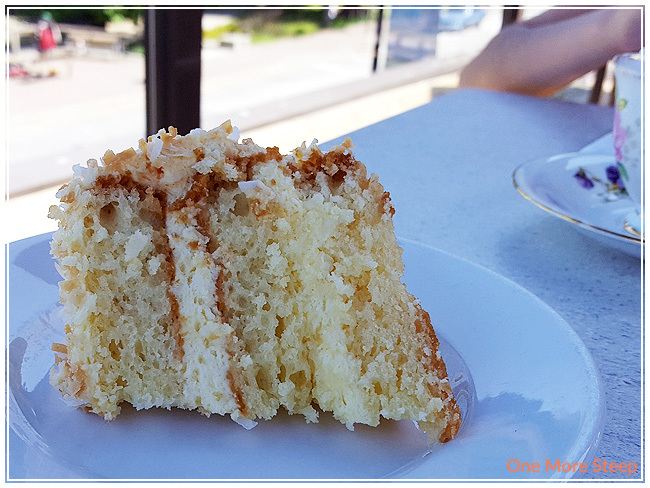 Lastly, the coconut cream cake had a great cream between the layers. I found the cake itself to be on the dry side (or maybe it’s just me thinking that there should just be a lot more cream!). I’m generally a fan of cakes that have more cream/frosting/icing on it, so that might be where I’m coming from. My favourite desserts were definitely the macaron and the panna cotta. Above: tiramisu. 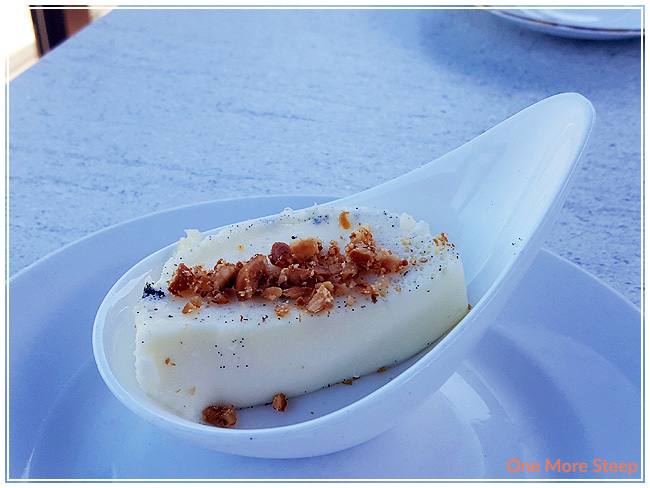 Below: panna cotta. For those who aren’t in West Vancouver, Bay Moorings might be a bit of a drive. Luckily it was mostly highway driving for me to get there, and traffic wasn’t too bad when I was going to and from Horseshoe Bay. 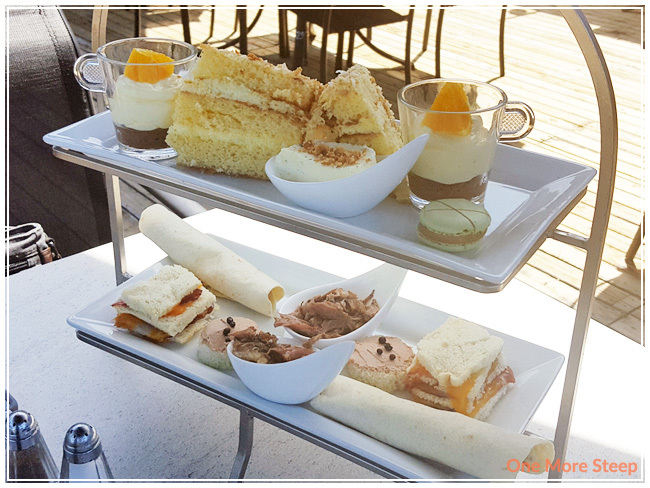 It was a beautiful day that my sister and I opted to go to Bay Moorings to check out their high tea. Good tea with good views. I’d go back for the smoked salmon wrap, duck confit, and that panna cotta.